October 2018 Residential Housing Market report for the Greater Chattanooga and N. GA areas. year-over-year percentage change gaps in sales, inventory and prices. was down 7.9 percent to 3.5 months. for industries related to real estate. percentage change gaps in sales, inventory and prices. 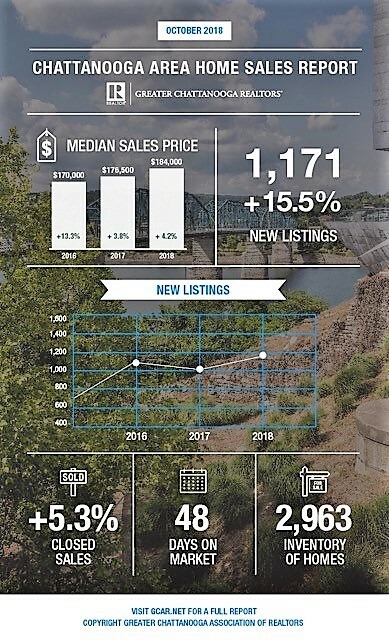 New Listings in the Chattanooga region increased 15.5 percent to 1,171.
six months. This is exceptional news for industries related to real estate. have widely reduced the march toward record highs. If you or someone you know is in themarket to buy or sell a home, then call The Paula McDaniel Group today!